The Comfiest and Coziest Pet Bed Ever. Treat your pet to the cozy, comfy Pet Cave. 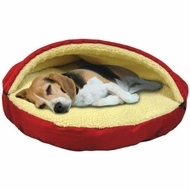 Pet Cave has a 5 inch thick poly-fleece lining to keep your pet feeling warm and safe. It has a cuddle cove flap on the top that adjusts perfectly to the size of your pet. Pet Cave is machine washable, so your pet can use it all the time. Product Features: Materials: Polyester/Cotton Fill Type: Polyester 5-inch; Thick Poly Sherpa Lining Creates A Plush Haven For Your Pet Rugged Interlaced Material is Built to Withstand Tears and Scratches: Cuddle Cove Zips Up Quickly to Adapt to the Size of Your Animal The Pet Cave Provides Years of Comfort and Security: Polyester Cover is Easily Machine Washed and Dried to Keep it Fresh and Sanitary Comes in a 25 inch. Diameter - It's Like Your Dog Has its Very Own Sleeping Bag. Great for Vigorous Pups and Grown Up Dogs Alike. The Pet Cave Will Easily Become Your Dog's Favorite Place Fits Popular Breeds Like: Yorkshire Terriers Cavalier King Charles Spaniels Shetland Sheepdogs Dachshunds.